What women skull is made of that it needs no helmet! As we proudly say that today, men and women are equal. Not only this, women are coming forward in almost all the streams of career, education and awareness about health. But when it comes to the safety of women, they are unhappy to wear a helmet while driving. Is it about the beauty and hairstyle? If yes, can we take a risk of our lives for just one hairstyle? Yes, they are not habitual of wearing helmets. But this is the time to wake up and come out of the world of ignorance. They say women are more sincere than men. If it is so, which I think it is, they should realize the importance of safety more than men. Today’s women are independent, successful, health conscious and you can see them always talking about equality. They want equal rights, equal wages; but in case of wearing a helmet they say, ‘please excuse us, we are women, don’t be so harsh’. Any traffic rule, when it is passed, it is not gender based. It is for all, then how can women think of this overgrowing number of vehicles they are safe and men not. 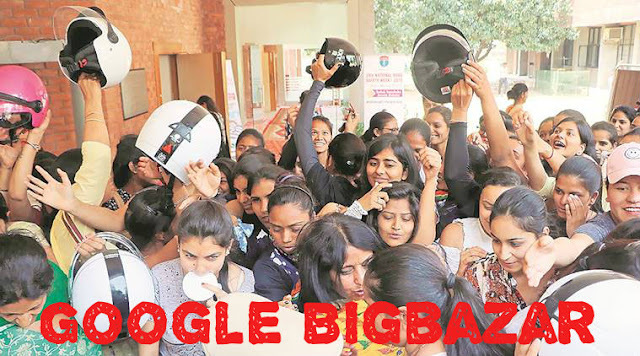 Cops distribute helmets to the ladies! It is everyone’s duty to obey the traffic rules because this is for our safety. In Chandigarh, Traffic police are doing a great job by handing over the helmet to women free of cost; teaching them the importance of wearing helmets and giving them information about the quality of helmets. Well, there are some women are happy and enjoying this drive. It can be noticed that some women always wanted to wear helmets as they like it and are aware of their importance. But, they were not wearing helmets as they will look different from other women. In the end, it can be said that wearing a helmet is important for everyone’s safety and we should not even wait for a rule. One should think about his/her safety …..And, ideally, it should not be forced; rather it should be taken as a responsibility to wear a helmet. What are you doing????..... It’s for your own safety! In any case, the rule of wearing a helmet for women is a positive step which should be caught up all over the world.